Don't Have Time Visit Dentist? 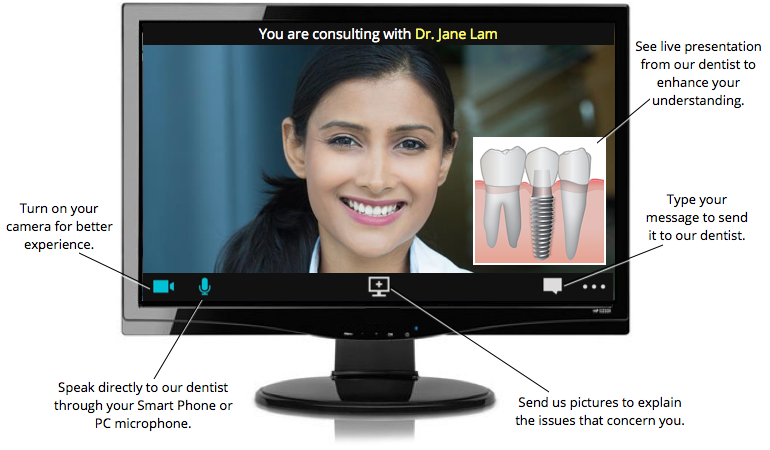 ﻿Our video consultation uses modern Internet technology to provide secure live video chat with our dentist without having to leave your home or office. Talk to our dentist online via your Smart Phone, tablet, laptop, or PC. The video consultation was amazing. Now I can get benefit from their dental expert online without wasting time commuting and sitting in traffic. Pick a date and time that you wish to have a video consultation with our dentist. Before the appointment time, we will send you a reminder with the link to connect to our dentist. Click on the link we provided you and we will connect you with our dentist via a secure video chat. Each online consultation lasts approximately 10 to 15 minutes. The consultation costs RM25 per session, will be paid in full upon booking appointment.